If you love sports and want to socialise with a network of active people, then GAME TIME is for you. 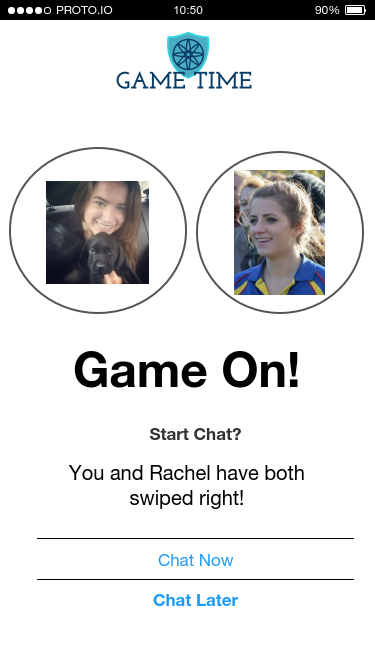 GAME TIME is a mobile app for iOS and Android devices that links users who are either interested in trying a new activity or to those who share similar sporting passions. The app will then connect groups or individuals with local facilities to find open courts, pitches, fields or other available areas and send a notification to the user. Looking for workout buddies, team mates or fellow sports lovers can be a bit of a hassle at times, especially when you have just moved to a new area, want to try a new sport or already partake in a niche activity. At GAME TIME we’ve done all the hard work for you, so finding new friends and staying active is easy through a range of activities including anything from walking groups to football to kite surfing. 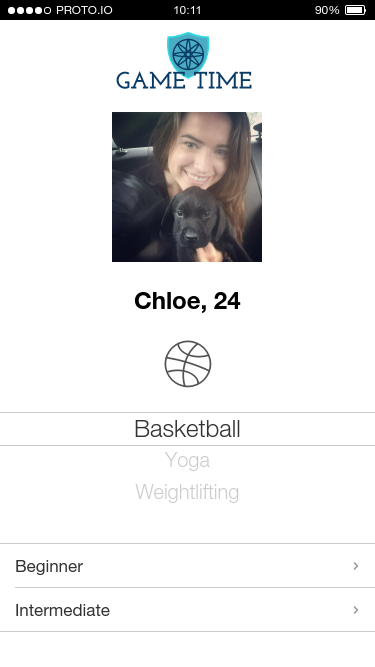 To get started on the app, users create a profile, which can be linked through social media, and select a sport(s) they are interested in alongside their ability/experience, age, gender and location preferences. 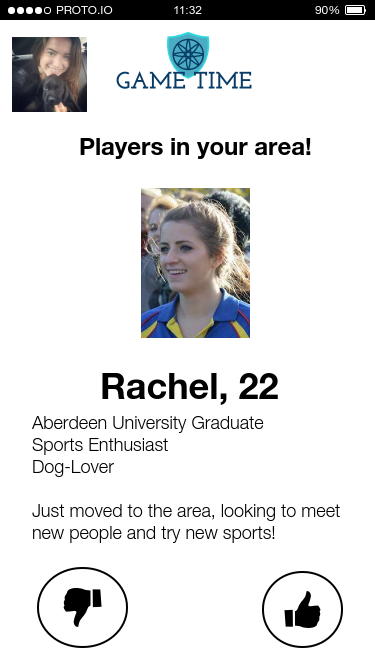 After selecting a sport(s), the app will then present a number of groups or individuals that are looking to connect and play those sports in the specified area. Swiping right will indicate if the user is interested in connecting with the group or individual. If the group or individual has also swiped right, a chat option will pop up and the participants can begin to share information such as date, time and location. Events can also be held by sport clubs and gyms to encourage people to sign up and can be promoted to users likely to be interested through the app. The app will be free to use with the option to purchase a GAME TIME Premium Membership. Sports clubs and facilities can also get in on the action by pushing notifications to potential users regarding vacant times for sports facilities at discount prices. This allows gyms to fill facilities that would otherwise be empty while also attracting users during times that could be cheaper to play. This gives clubs and facilities another channel to advertise to potential users. We need your help to make our vision a reality, but we have created some prototypes of our app to help communicate our dream. What will you do with the funding once you’ve surpassed the goal? GAME TIME will use any funds pledged, which surpass our goal to further develop the app for the benefit of the user. How will GAME TIME make a profit? Through Premium Membership options, paid for advertising space and charging facilities to push notifications about available playing times through the app, GAME TIME is sure to be successful. Is there an age restriction for the app? Users must be 18 years or older to use GAME TIME. Why would I want to continue using GAME TIME after I found individuals or groups I play with regularly? The app will offer Premium benefits, discounts on facility spaces and memberships, as well as a wide variety of new people and activities to try. What does a GAME TIME Premium Membership include? A paid for Premium account will hide ads, undo mistaken swipes and allow access to exclusive discounts on sports/lifestyle brands, facility memberships and exclusive GAME TIME events. We will continue to add benefits and develop the Premium Membership option. What happens if the campaign is unsuccessful? Payments will not be processed until the project is completely funded. Donations between £2 and £19, our backers will be welcomed into the GAME TIME family by receiving a personalised shout out on our company website under ‘OUR TEAM’. For donations between £20 and £24, our backers will receive two exclusive pieces of hand designed GAME TIME merchandise of the highest quality. For donations between £25 and £44, our backers will receive exclusive access to the app as soon as it has been developed and 6 months free premium membership + a hand designed headband OR water bottle. For donations between £45 and £99, our backers will receive exclusive access to the app as soon as it has been developed and 1-year free premium membership + a hand designed headband OR water bottle. For donations of £100-£299, our backers will receive exclusive access to the app as soon as it has been developed and a year's free premium membership + the choice of TWO items of hand designed GAME time sports wear. For donations between £300 and £500, our backers will receive exclusive access to the app as soon as it has been developed and a lifetime free premium membership + the full range of hand designed GAME TIME sports wear. For donations of £500+ the GAME TIME founders, Hannah Blackford, Leigh Wolf, Tom Fee and Emily Cheng, will host a fabulous evening of dinner and entertainment at a top Edinburgh venue and backers will receive lifetime premium membership, exclusive access to the app + the full range of GAME TIME sports wear. These backers will also receive exclusive news and developments about the company and future investment opportunities.